Tesla shares sank as much as 7% Friday following an emotional interview by CEO Elon Musk. The billionaire told the New York Times that the past year has been “the most difficult and painful” of his career as he has struggled to make Tesla profitable and jabbed with short-sellers. Tesla is more than 30% below his $US420 target buyout price. 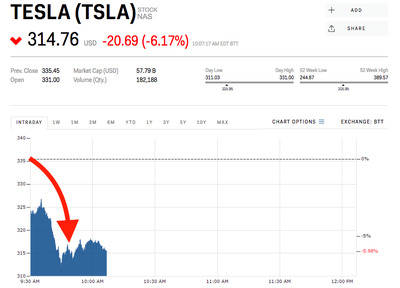 Shares of Tesla sank more more than 7% Friday, nearing their lowest price this month, after Elon Musk opened up to the New York Times about his bid to take the electric-car maker private. 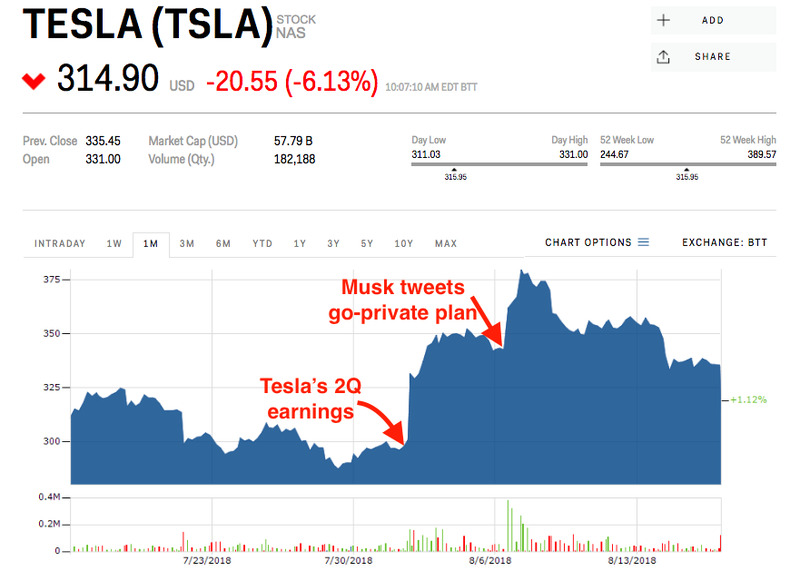 The emotional, hour-long phone interview focused on Musk’s cryptic tweet that stated he was “considering taking Tesla private” at $US420 per share and the regulatory fallout that has followed. It also featured a candid Musk discussing what he says has been the worst year of his life. Tesla shares are now trading at a 32% discount to the $US420 target Musk laid out in his cryptic tweet last Tuesday. In the interview, Musk was quick to clarify that it wasn’t a weed joke. $US419 was a nice, round 20% premium to Tesla’s stock at the time, but “it seemed like better karma at $US420 than at $US419,” he said. Tesla is down 1.5% this year, and has given up all of its gains from the announcement that it would seek to go private. If the shares fall below $US300, they will have given up all of the gains seen in the wake of Tesla’s second-quarter earnings report on August 1.